1. NASA employs George Aldrich's extremely sensitive nose to smell things before they go on the space shuttle, in order to prevent odor build up during long missions. Contributions would include determining the edibility/potability of food/water. Sniffing for radiation contamination. Sniffing for more ammunition. 2. Ron Perlman is a classically trained actor from New York. He is relatively ambidextrous. If radioactivity mutates us all into horrible looking monsters, Ron will already be accustomed to that sort of thing. 3. Russ Byar is an American man inducted into the Guinness Book of World Records for causing a stone to skip along the surface of a body of water 51 times in one throw. Potential contributions include throwing grappling hooks from building to building, tossing molotov cocktails with deadly accuracy, taking out security cameras with small stones, and casually killing time. 4. Hailing from Colorado, Katherine Browne fills the critical spot of Falconer on our list. Bonus: When not training birds of prey, she is an avid fly-fisherman and white water rafting guide. 5. The Palmview Kid (not his actual picture) is an 11 year old boy from Texas who successfully held off two masked home invaders, protecting his mother with a .22 caliber rifle. After taking a bullet to the hip, the Palmview Kid fired through a bedroom door, catching one intruder in the neck and putting the men to flight. He will walk in front of me. 6. Though most writers love to compare Matthias Schlitte to Popeye, I prefer the simple moniker "Gigantarm." According to Ripley's Believe It or Not, Matthias suffers from a genetic condition that caused his right arm to grow 2X bigger than his left. So he made the best of it and became an arm wrestler. I guess it's also possible he worked out his right arm 100X more than his left to keep his body puny and thereby compete in smaller arm-wrestling weight classes. Either way, Gigantarm is a brilliant young tactician with a giant right arm and I've got dibs. 7. In early 2010, Angel the Golden Retriever heroically intercepted a wild cougar hellbent on maiming her eleven year old master. Though it nearly cost Angel her life, she held the cat off long enough for a local constable to come and shoot it. Angel will walk in front of the Palmview Kid. 8. Jamie Hyneman, Mythbuster. Selected for obvious reasons. 9. Kari Byron, Mythbuster. Selected for even more obvious reasons. 10. Bao Xishun currently holds the World's Tallest Man record. Hobbies include marrying much shorter women and removing debris from the trachea of choking dolphins. 11. Khagendra Thapa Magar, World's Smallest Man. Good for getting into those hard to reach places. Magar will ride atop Bao and use a spyglass to scout ahead of the group. 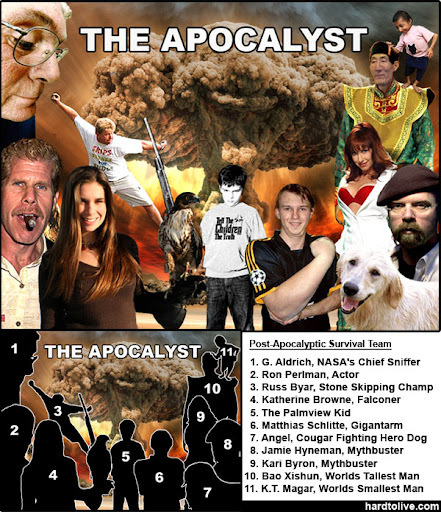 The Apocalyst continues to grow as the End draws near and I look forward to updating occasionally. In the meantime, who's on your list? 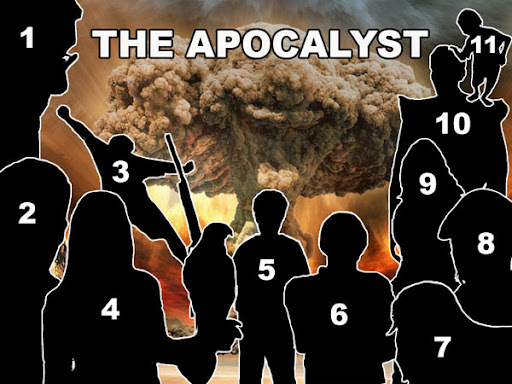 UPDATE: The Apocalyst is now featured by our friends at survivetheapocalypse.net. Thanks, gents!